This week I hope to lay to rest one of the big questions that has plagued many a social media person’s conscious since at least 2010 – is there much point in uploading videos to both Facebook and YouTube? I’ve been doing some experiments with a high profile page and YouTube channel and can bring you nothing but straight up fact. So if you would like to find out where you really should be uploading your videos, read on. It comes down to time really. Everybody knows YouTube is the daddy when it comes to online video. There’s a stupid amount of visual content uploaded every second and it’s one of the top destinations on the entire internet. So if you’re making videos, you need to upload them there. But with the time it takes to upload a video, optimise the description and keywords for SEO and then schedule posts on your other social networks to make sure people know about it, you might not have time to even think about uploading it anywhere else. Especially when you get sidetracked by the latest “cat makes funny face” video or any of the six million “you won’t believe what this girl did then her dad walked in” clickbait monsters. So why bother uploading to other networks like Facebook when you can just link back to the central source? I wondered the same thing, so I did a little experiment. I created a “hilarious” voxpop video asking peoples’ opinions on cleaning and needed the world to see it. Normally I’d just upload to YouTube and then spread the link about through every other social media channel. This time I did it differently. Not only did I upload the video to YouTube, I also uploaded the video directly to Facebook. I then scheduled two posts to go out on a Facebook page at the same time on different days. One was the Facebook video post, the other a link post to the YouTube version of the video. All descriptions were kept the same. For stats fans, these posts were made to a Facebook page that has (at time of posting) 31,632 likes. With the changes to EdgeRank earlier this year, you would expect an average reach of roughly 5% which is about 1,500 people. Nothing ground breaking there, in fact you could say a huge waste of time. Just 6 likes, 3 comments and 2 shares and only 37 out of 1,665 people even bothered to click the link. Wowsers! OMG! WTF! 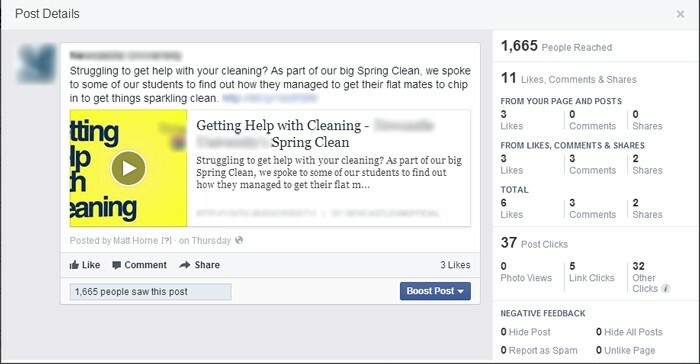 Nearly a five fold increase in reach! 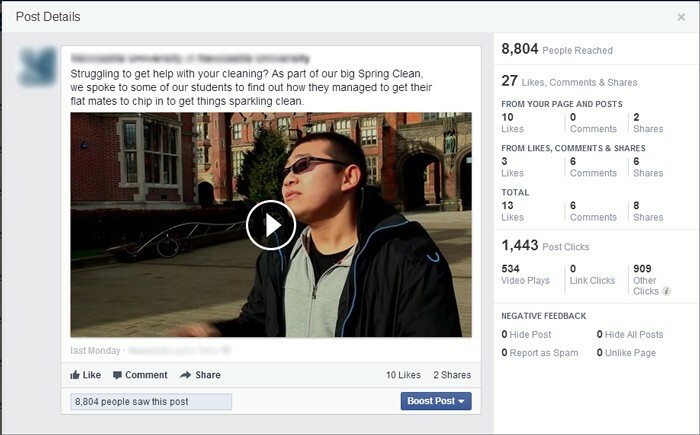 The post reached 8,804 people, had 534 video plays and a total of 13 likes, 6 comments and 8 shares. Now That’s What I Call Engagement Vol 26. I think you’ll agree, those are pretty conclusive results as to whether you should upload your video to Facebook and YouTube. As a side note, notice the vast difference in visual real estate given to each post. The YouTube link has a tiny box image like a TV from the 50s. The Facebook video has an IMAX sized preview box. Maybe a clue to why there’s increased engagement? 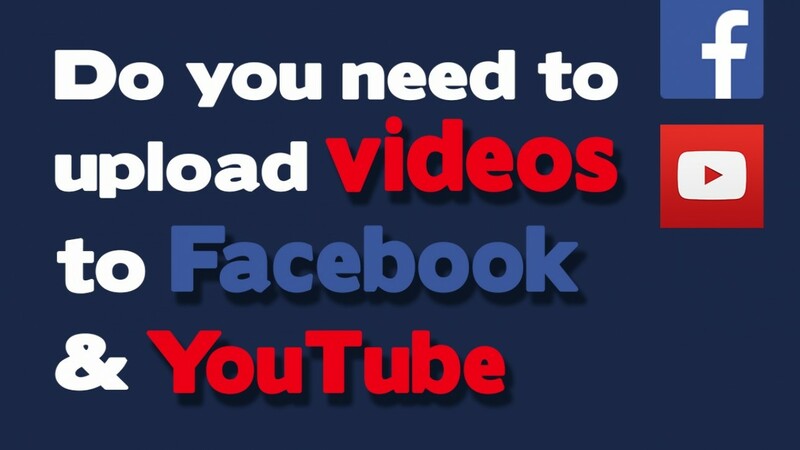 If you want maximum exposure for your video content, you need to upload to YouTube and Facebook. It would seem not only does Facebook game the exposure of certain types of post, it definitely favours those video posts that are based on its own servers. It makes sense really as it keeps views on their site, where they can feed viewers their adverts. It does mean you need to take more time out of the day, but if you’re investing in video content, you want to make sure as many people as possible see it. So there you have it, undeniable proof that you should upload your videos to both Facebook and YouTube. Not sure what the best way to go about doing that or even how to make the videos in the first place? Then get in touch I’d be happy to help out.